The internet became an important outlet for relief donations in the aftermath of Hurricanes Katrina and Rita, with 13 million Americans, or 9% of internet users, going online to give money in aid of victims of the Gulf Coast hurricanes. In addition to serving as a conduit for donations, the internet was an important source of news, information, and dialogue about the disasters. Half (50%) of all online Americans turned to the internet for news and information about the Gulf Coast hurricanes and their aftermath. One quarter (24%) shared emails or instant messages about the storms; 9% used the internet to check on someone’s safety. At the same time, a notable number of Americans used the internet to move beyond traditional institutions as they looked for news about the hurricanes and information about relief efforts. Some 17% of those who got news about the disasters read blogs to get details and insights into the impact of the hurricanes on affected communities. Some 5% of internet users – or 7 million people – went online to set up their own relief efforts. And 4% posted their own material such as comments, links, and pictures related to the hurricanes on online blogs, bulletin boards or chat rooms. The Pew Internet Project has in the past asked about online donations to charities following major events. After 9/11, 10% of internet users, or about 11 million Americans, said they had at one time made an online donation. These donors did not necessarily give because of the terror attacks, but a number obviously were inspired by the attacks to make contributions. Following the Asian tsunami at the end of 2004, 13% of internet users, or 17 million Americans, said they had made a donation to charity online. Again, these donations were not necessarily made on behalf of tsunami relief efforts, but it was probably true that the tragedy had moved at least some new entrants into the online donor population. When queried after Katrina and Rita, 26 million Americans – 18% of internet users – said they had made a donation online, with half of them saying their donations were specifically for Gulf Coast hurricane relief. 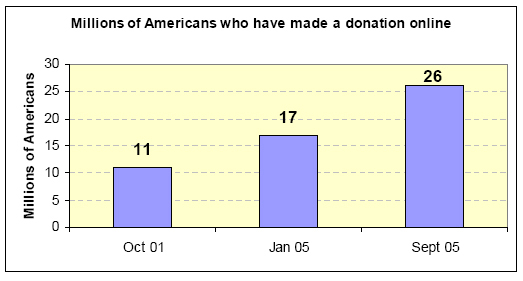 Since the beginning of 2005, the number of Americans who say they have ever made an online donation has increased by 53%. Internet users were also active in using other online tools to keep track of developments and share their reactions with others. One-quarter (24%) of all internet users sent emails or instant messages pertaining to the storms and their aftermath. The same number (24%) used the internet to find out where to make contributions to relief efforts, with a smaller share (5%) saying they used the internet to organize their own assistance efforts. For some online users, the internet helped in more urgent ways. About 9% of users said they used email or the internet to check on the safety of someone who might have been affected by the hurricanes. And 4% of internet users said they posted comments, links, pictures, or other materials to online bulletin boards, chats, or blogs. Nearly three-quarters of online hurricane news consumers – or 73% – turned to the Web sites of major news organizations such as CNN.com or MSNBC.com for news about the hurricanes. Even though major media outlets were the most popular places to go, other kinds of news sites played important roles in filling out online users’ newsgathering habits. One in seven (14%) went to an international news source for news about a U.S. domestic crisis and nearly one-third sought out hurricane information from non-profit organizations. It has consistently been the case in Pew Internet Project surveys that home broadband users do more things online – and more often – than dial-up users. This pattern holds true when looking at online news consumption post-Katrina when the focus is on likelihood of getting news about Katrina online or not. 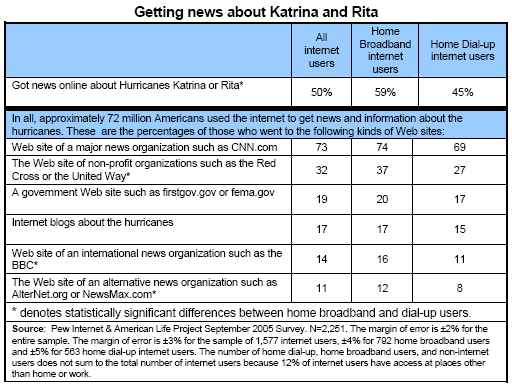 However, when looking at specific types of news sites given that a respondent got Katrina news online, the differences often aren’t great and, in a number of cases, not statistically significant. This modest anomaly is probably attributable to the strong desire for lots of information in the face of such a large natural disaster. 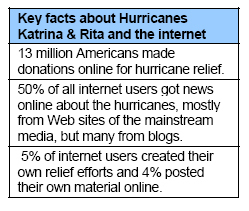 Established media organizations covered Katrina and Rita heavily and it is no surprise a large majority of internet users turned to them online. For blogs, international news sites, or online-only sites, connection speed matters in some cases, though not a great deal. It appears that the magnitude of the story mitigated somewhat the usual differences in internet behavior between broadband and dial-up users.